David Hallberg, Urban Air Initiative policy consultant, will present “Examining the Public Health Threat of Gasoline Emissions in Urban Areas” at The Slowdown during an Omaha, Nebraska, Science Café Tuesday, Sept. 1 at 7 p.m. The American Coalition for Ethanol honored a select group of individuals and companies for their substantial efforts to advance the U.S. ethanol industry during ACE’s annual conference in Omaha, Nebraska, last week. Merrill, Iowa-based Plymouth Energy is building a rail spur and ethanol holding capacity six miles away at Le Mars, providing better access to eastern markets. 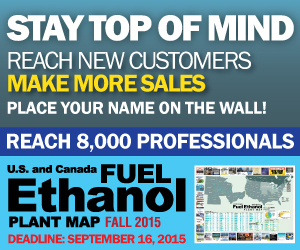 The U.S. Grains Council expects this year's ethanol exports to reach 850 million gallons, valued at $1.9 billion. That's up from 768 million gallons last year. Australia will produce 70 million gallons this year, about 60 percent of capacity, according to GAIN report. Seasonal pressure is coming to bear on the natural gas market. As summer is ending and winter is still a ways off, the natural gas market is positioned for short term price weakness. The Renewable Fuels Association, the Oregon State Police’s Office of State Fire Marshal and the Roseburg Fire Department will co-host three free Ethanol Safety Seminars Aug. 31–Sept. 2 in Roseburg, Oregon. Over the last month, the Dow Jones Index posted significant losses nearing 3000 points, with over 2,000 of those erased last week. Concerns about the devaluing of China's currency and distress in other global economies have created market pressure. Fuels America sponsors full-page ad in Las Vegas aimed at President Obama during his appearance at the National Clean Energy Summit. Corn is trying to make headwinds despite the USDA increasing its production outlook in August. In addition, outside influences will limit upside momentum. With Labor Day approaching, DDGS prices have dropped back down to early July values, at best, after having rebounded a bit at the end of July and early August. Chinese Gulf demand has begun to drop.